A few cups of coffee, pumpkin pancakes and eggs fueled a mid-morning 4+ mile run on the Boreas Pass Road. 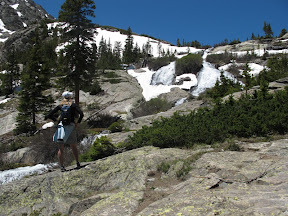 Afterwards, Tara and I re-packed for a simpler hike up McCullough Gulch. Wildflowers were barely out and a lot of snow remained to melt. 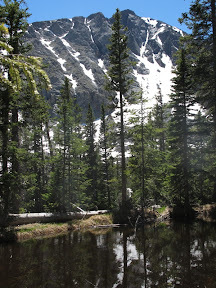 Still, White Falls was beautiful as always and we hiked to the lake above, excited for the alpine views. The lake was its usually windy self, so we headed back down the trail to cook and grill the plunder from a visit to the Breckenridge Farmer’s Market. 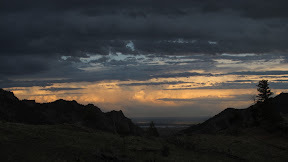 The Eldorado Canyon route “Anthill Direct” has been on my to-do list for a while, but with a spooky run-out pitch I didn’t see myself leading it all anytime really soon. 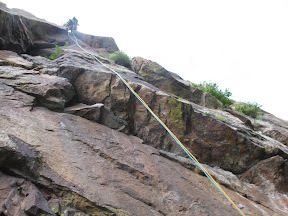 So when Tara’s climbing partner Brad suggested we tackle the route and was willing to lead whatever pitches I didn’t want I was psyched to go. 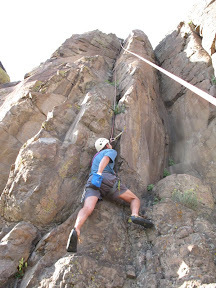 As per the division of labor we agreed on in the parking lot, Brad strung together the first two pitches of “Touch and Go” while I belayed on his brand new double ropes. Tara and I followed then I took the sharp end for one of my few turns leading on double routes for the pretty-straight-forward next pitch. 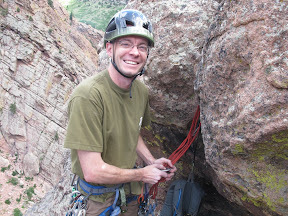 Some easy crack and face climbing lead to a small roof and a tiny-for-3 belay stance. Brad linked the next two pitches of wandering and run-out 5.7. 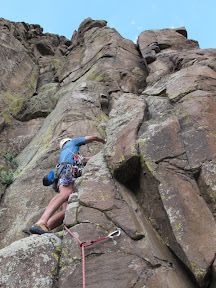 The last pitch was mine again, and a classic 5.9- roof to finish up on flatirons-like slab. Brad then showed us the east slabs descent from the Redgarden Wall. It was a warm afternoon, but a few clouds kept temperatures reasonable as Gary and I hiked up to North Table Mountain’s Golden Cliffs. 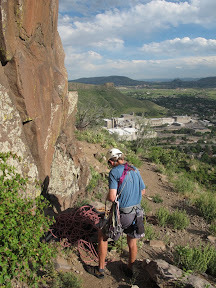 He had a route in mind and led us around to the west side of the basalt cliffs to rack up above the Coors Brewery. It takes me longer to type the route name “Shut Down, Plugged Up, and Cold to Boot” than it took Gary to lead it. He lowered off the chains and I cleaned the route before we moved further north to the 5.8 classic “Bush Loves Detroit”. Another group was just starting up so I took my time organizing the rack and taping my hands. Having watched the earlier leader layback the upper crack and struggle a bit I was mentally prepared for a bit of a fight. Thankfully, the crack was “perfect hands” for me and I found solid jams and good rests without resorting to a single layback. 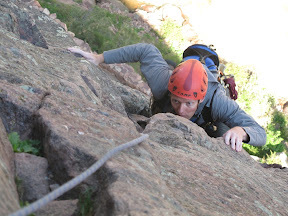 Gary didn’t have quite the same luck with the #1 C4-sized crack as he cleaned the route. For his next turn to lead, Gary chose the route just called “Unknown G” in the latest guide. 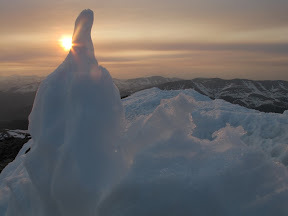 After moving through some blocky terrain with kitty litter, he hit a dirty and short but perfect pair of hand cracks leading to the flat summit. I found the cracks to be a blast and wished they were twice as long. 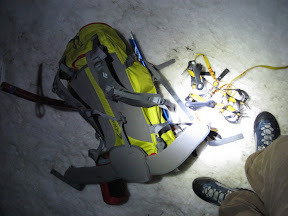 The route could also use more frequent ascents to clean up, I was certainly glad I’d taped up earlier. 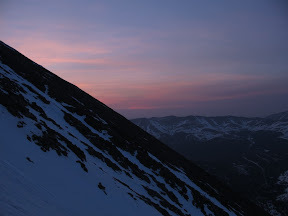 The sun was setting but we had enough time to squeeze out one more climb before dark. Starting back towards the parking lot I parked us below “Fast Boat to China”, another classic 5.8 pitch and required two starts on the slick bottom section. Higher up I took a second to notice the colorful sunset before reaching the anchors. Gary cleaned the route then we packed up and started hiking out thinking we were real adventurers for climbing until dark. 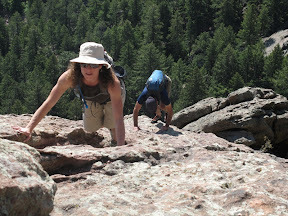 Much to our egos’ chagrin we found 3 other groups still climbing while we returned to the cars. Winds were rocking the car in the parking lot while a light rain was hitting the windshield. 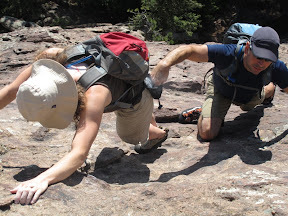 It was enough to convince Tara and I to scuttle plans to go rock climbing in Eldo for a hike around Walker Ranch. Conditions improved by Saturday morning when I met Jonathan to carpool into the canyon with the idea of climbing the classic Bastille Crack. It’s cold, north-facing location has kept me off it during the non-summer months the base almost always has a line of climbers queued up. Today we saw one party’s leader just at the end of the second pitch with the second following and no line. Racking up at the car we hurried to the base to start up. I linked the first two pitches and found the radios very helpful to communicate with Jonathan down by the river. Jonathan re-racked and set off up the steep crack above the ledge I was on with the goal of linking the next two pitches. As he disappeared over the next ledge and the rope slowly crawled upwards, I watched climbers hiking in and ascending Whale’s Tail and Redgarden Walls. Demonstrating perfect spacing, another group started up the first two pitches of the Bastille Crack and setup a belay just below me right about when Jonathan was anchoring himself below our last pitch. 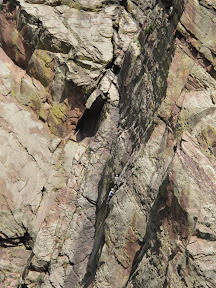 I followed his wandering route and then chose a 5.8- finish for the final pitch to the top of the Bastille. Coiling the rope we scrambled to the south and then around the west side and back to the parking lot. It was only noon, so we tanked up on water and returned to the Bastille where Jonathan decided to tackle Blind Faith (5.10a). 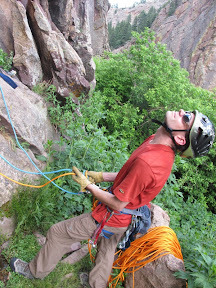 The crux hand crack proved difficult and he backed off to setup a belay just below those moves. 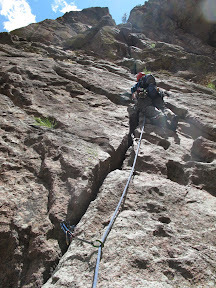 I cleaned the lower part of the route, then took on the crack. The hand jams weren’t as secure as I’d have liked, and a rest while thinking through the sequence got me up with maybe just a tad bit of french-freeing (I palmed the top of a cam that was blocking a good jam). For the second pitch, I should have traversed left to join an easier route, however Jonathan proved persuasive in convincing me to lead the 5.9 second pitch. Already tired from fighting through the lower pitch, I only made the crux move with another french-free move. Jonathan was similarly tired as he actually broke out his prussiks to get by this second when he followed the pitch. Having a bit of time, but no energy for any more routes, we mocked up a couple self-rescue scenarios without leaving the ground before calling it a day. 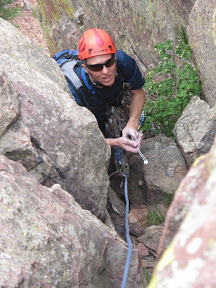 I was preparing to head out for another solo day scrambling in the Flatirons when I heard that Jenn and Jeremy were planning to do Freeway, a long 4th class route up the Second Flatiron. More than happy for their company I agreed to join them and serve a bit as a guide (having done the route once 2 years ago), but they may have gotten more than they bargained for as I drug along two cameras. 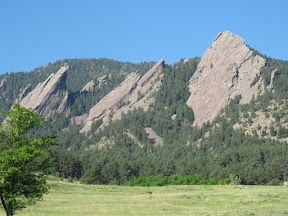 A short hike from Chautauqua took us right to the base of the route where rock shoes and a couple chalk bags emerged from packs. I led up trying to find the easiest terrain and was mostly able to follow chalk marks from prior ascensionists. Once we moved up from the shade of the trees it got a bit hotter and Jeremy had to beg some chalk from Jenn. Climbing ahead and shooting video with a GoPro camera mounted on a small tripod I had a bit of excitment when the camera slipped off its perch and tumbled to Jenn’s feet. I felt lucky on two accounts: one because the camera was fine and two because it captured the whole ride on video. After the “diving board” another soloist passed us and helped take over leading duties towards the end of the route. We also got some expansive views including the neighboring First Flatiron and some climbers on the Direct East Face route. The thought to just ignore my alarm runs quickly through my otherwise slow synapses at 3am. However, this is my main chance to get outside this weekend and I’ve told too many people my plans to back out now. Downing coffee I drive to the Blue Lakes reservoirs and pull up on some campers organizing gear. I quick check with them confirms this is as far as the road is drivable (1 mile from the upper Blue Lake). After parallel parking next to their tent, we have a brief conversation about the temperature (barely freezing) and likely snow conditions (probably good, as the sky is clear) and I start walking the road. 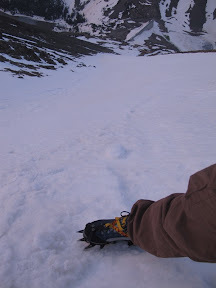 Twenty minutes later and it’s time to head up after putting on my crampons, helmet and readying an ice axe. Following yesterday’s ski tracks I connect patches of snow through the rocks low down and stay away from willows. The snow is punchy in a couple spots, with a freeze that didn’t extend well down below the top. Thankfully it grows firmer as I gain elevation. Looking back down I keep expecting to see others on my tail (there were 4 other cars at the end of the road), but everyone else is either sleeping in or taking longer to get going. I do watch a few headlights drive up the road and later hear that they could see my headlamp. I haven’t been above 13,000 feet all year, but moving slowly like the haiku snail on Mt Fuji I keep from needing any breaks. Dawn breaks through the haze and finds me a few hundred feet yet from the top. Reaching the summit at 6am I’ve got the world to myself and sit around enjoying the rarefied air until the wind drives me back down. I’m halfway down the couloir and warmed up when I reach the crowds heading up. 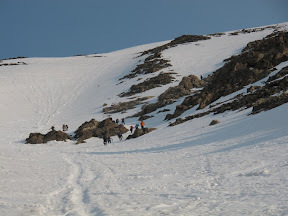 They’re installing a nice staircase in the warmed snow and most are carrying skis for the descent. 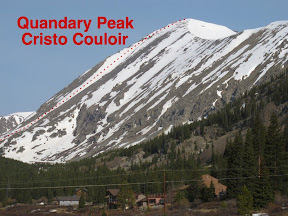 The lower portion of the couloir would make a nice glissade if I’d waited longer for it to soften, but it’s still too firm at this hour. By 8:30a I’m back in Breckenridge and with an appetite worked up to carry me through the two cookouts I’m lucky to have been invited to today. 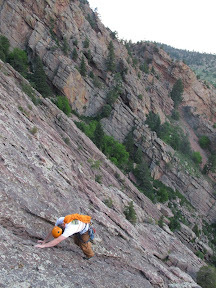 Tara had asked to climb Rewritten (5.7) in Eldorado Canyon and since it’s both a great route and has a few pitches I hadn’t yet led I was more than willing. A reasonable start had us the first on the this popular classic on a Friday morning. For the third time, I found myself leading the Great Zot’s first pitch (5.8) to start off the ground at the Redgarden Wall. Tara pretty quickly followed, taking a different line through the small crux roof before reaching the belay stance. 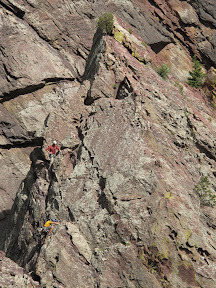 The second pitch is easier and leads to a nice belay ledge, abet one already occupied by a Colorado Mountain School guide who was bringing a client up the Green Spur to this point. Given that we were on an easier route, Tara reached the belay first of the two followers and the guide graciously let me start up the third pitch ahead of them. 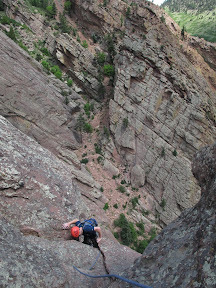 The third pitch is pretty easy, but also a chossy gully of loose rock. Careful climbing is required, especially when there are climbers below which is pretty much always. 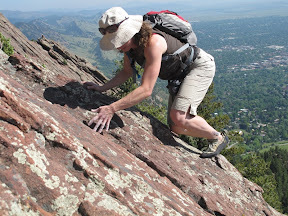 Tara tried to turn the dihedral climbing into some face moves, but soon found the route and joined me atop the pitch. By now a third party was climbing up from below and catching all of us. After re-racking I quickly started the classic 4th pitch with its famous hand traverse followed by the steep finger crack. I wished I’d had my camera accessible for the shot looking back down at the crowds on pitch 3. By the time I’d reached the dead tree belay, the CMS guide decided to let the last group (climbing in aggressive “Euro-style”) pass and Tara was anxious about having them hot on her heels. So she let their leader start up, then followed some distance behind. With two ropes on the pitch and two sets of gear she was going to have a more complex time following this pitch. Thankfully, the speedster’s leader kept out some penalty slack to keep his aggro partner from breathing down her neck. 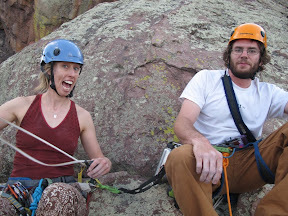 At least this belay ledge was pretty comfy and made a nice waiting spot while we let the hurried pair climb to the top. 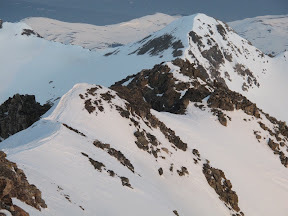 To speed our own ascent a bit, I linked the last two pitches, continuing up from the exposed and fun Rebuffat’s Arete to the summit. 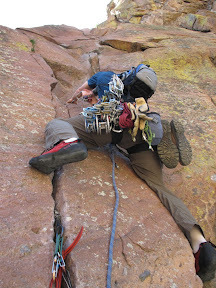 Tara (who says she doesn’t like aretes [or dihedrals, slabs or cracks]) actually found this pitch enjoyable. 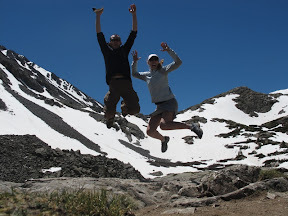 Below, I was surprised to see the CMS guide had taken the original finish to Rewritten, but Tara and I did our best to keep him entertained with our witty banter as she neared the summit. On top we coiled the rope and started the scramble and walk north, getting lost (er, getting some extra hiking in) only briefly before finding the correct route down and back to the base.